Brutal and unforgiving, a band who get the sheer vicious evil that you need to create top notch death metal today and pull it off with aplomb, that is all Heaving Earth are, that is what they represent. Blasphemous and head grinding death metal from the crypt. Their is something hypnotic about the unyielding blasphemy of Heaving Earth's music, the way the band blares forward with an apparent disregard for all that is good, just, and holy. This is the kind of metal that will keep your skull from staying together. This is the sort of band who prove the undeniable might behind a genre that has brought itself up on death and decay. Sure the songs might not always have the tightest production but the raw death metal evil is undeniable. 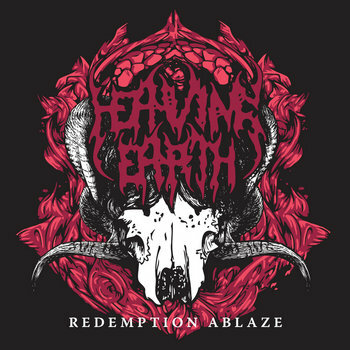 Their new EP Redemption Ablaze is concentrated aggression, just under 12 minutes of some of the most explosive metal you will ever hear. Such is the might of Heaving Earth, turn them up to loud and the world might just crack open and swallow you up!